Women's -57kg Final Match Under Way at 2013 World Taekwondo Grand Prix Final in Manchester, UK — Great Britain's Jade Jones (in red uniforms) is in action with Spain's Eva Calvo Gomez in the women's -57kg final match on the third and final day of the inaugural 2013 WTF World Taekwondo Grand Prix Final at the Manchester Central Convention Complex in Manchester, UK on Dec. 15, 2013. Calvo Gomez won the match 4-3 for the gold medal. Spain and Russia grabbed one gold medal each on the third and final day of the “2013 WTF World Taekwondo Grand Prix Final” held in Manchester, the United Kingdom on Dec. 15, 2013. After three days of competitions at the inaugural 2013 WTF World Taekwondo Grand Prix Final, Russia topped other countries in the overall medal tally as it took home two gold medals, one silver medal and one bronze medal. Host Great Britain came next with two golds and one silver, followed by Spain with two golds, Chinese Taipei with one gold and one silver, and Sweden with one gold. Korea came next with three silvers and one bronze, while Brazil and Canada clinched one silver, respectively. 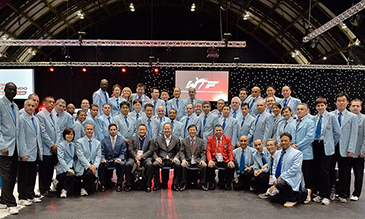 International Referees for 2013 World Taekwondo Grand Prix Final Pose — International referees participating in the inaugural 2013 WTF World Taekwondo Grand Prix Final pose at the Manchester Central Exhibition Complex in Manchester, UK on Dec. 15, 2013. 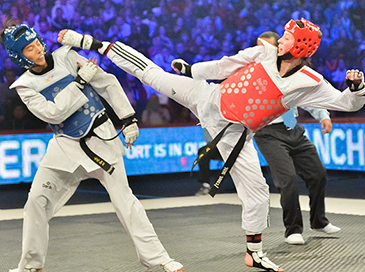 A total of 231 athletes from 59 countries competed for top honors at the 2013 World Taekwondo Grand Prix final, which took place at the Manchester Central Convention Complex. In the women's -57kg category, Spain's Eva Calvo Gomez brushed aside a stiff challenge from Great Britain's Jade Jones to win the final match 4-3 for the gold medal. Calvo Gomez, the bronze medalist at the 2013 Puebla World Championships and the 2010 Spanish Open gold medal winner, reached the final match by edging down France's Floriane Liborio in a fourth golden-point round. Jade Jones, the gold medalist at the 2012 London Olympic Games and the silver medalist at the 2011 Gyeongju World Championships, came from behind to beat China's Yuzhuo Hou in a semifinal match to advance to the final match. In the men's -68kg final match, Russia's Alexey Denisenko, the bronze medal winner at the 2012 London Olympic Games and the gold medalist at the 2013 Russia Open, earned his country the gold medal as he managed to defeat Canada's Maxime Potvin 1-0. Denisenko made it to the final match by beating Iran's Behnam Asbaghikhanghah 5-4, while Potvin, the silver medalist at the 2009 World Championships and the gold medalist at the 2012 Pan American Championships, reached to the final match as he outpointed Iran's Bagheri Motamed 3-0.